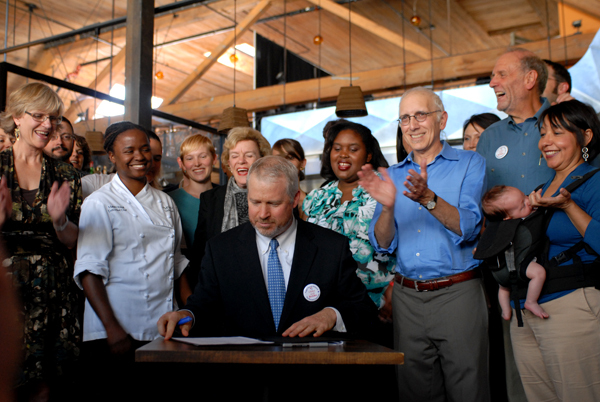 On September 23, 2011, Seattle Mayor Mike McGinn signed the Seattle Sick and Safe Leave Ordinance into law following an 8 to 1 vote by the City Council. The campaign by the Seattle Coalition for a Healthy Workforce generated wide earned media coverage and more e-mails and phone calls to Council members than any issue in memory. Public hearings and forums were packed. Workers, small business owners, and school nurses who rarely have a say in policymaking became key spokespeople, making a compelling case that paid sick days standards are necessary to protect public health and rebuild family economic security. The Washington Family Leave Coalition, coordinated by the Economic Opportunity Institute, helped launch the Seattle campaign in the aftermath of the H1N1 epidemic. For over a decade, the statewide Coalition has brought together seniors, women, labor unions, health professionals, children’s advocates, faith communities, low income workers, employers, and policy makers. The Coalition has successfully advocated for state-wide legislation that allows workers with paid leave to use it to care for sick family members, and that lays the foundation for a family and medical leave insurance program for all workers. We’re working together to make it easier for parents to raise healthy children and care for aging parents; for workers to care for themselves or family members during serious illnesses; and to establish modern workplace standards that improve productivity and worker health.